Tattoo by Design is Eugene’s oldest tattoo shop. We opened in 1985, and have always been at the same location in downtown Eugene on Lincoln Street. Our shop has become a trusted studio where customers bring their kids when they turn 18, and in fact we’re tattooing people today who were coming in with their folks when they were little kids. Bonnie Jean has created a shop that caters to a wide range of people, from head-over-heels tattoo enthusiasts to folks that will probably get just one or two discrete tattoos their whole life. Either way, our customers know that we care deeply about their tattoos, big and small. The place to start is by coming into the shop, meeting us, perusing our portfolios and checking out our work. We’re generally open every day, afternoons and evenings, and we do both walk-ins and tattoos by appointment. If you’re coming from out of town, it’s always a good idea to get to the shop in the early afternoon – sometimes by the late afternoons we are booked solid for the rest of the day. Please visit our studio even if you’re just curious, or know that your plans for tattoo work are a ways off in the future. It’s good to get an idea of what you’re going to be doing, before rushing in to get a tattoo on a whim. 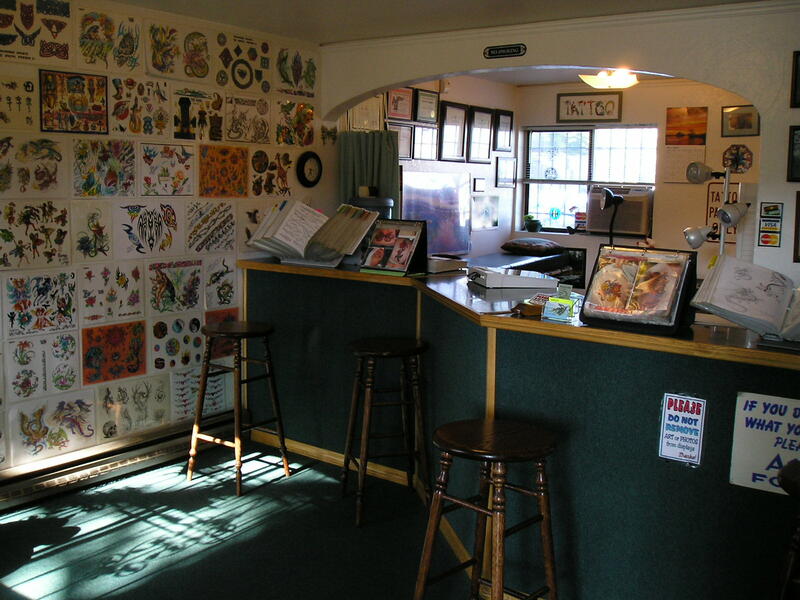 Visit all the local shops, to get a feel for how well different tattooists fit your plans. Of course, we hope you’ll choose us. We have wealth of artwork and resources in the studio – thousands of pages of artwork from tattooists all over the world, and original designs by our own artists. Some customers find the perfect design in our collection, but most look through our artwork for ideas for custom work. We encourage use of the web for finding tattoo designs in the same way. While you can find lots of designs on the web, a lot of other people are looking at the same designs. Small local studios are where you’ll find unique, custom designs. And remember: just because a piece of art is in the books or up on the wall in a studio doesn’t mean that the piece has been tattooed before – if you spot the perfect piece, maybe it was waiting just for you all along. Tattoo designs are very personal, regardless of whether you pick from the wide selection we have in our studios, bring in something of your own, or are asking for custom designs.We’ve chosen not to show much artwork on our website, for the privacy of our customers, and because we don’t want our very personal designs being duplicated all over the world. When customers bring in pictures of custom tattoo work found online, we encourage them to let us change those designs and make them their own -but how do we trust that all tattooists will have the same respect? Hopefully the small gallery we have here will hlep you to get the flavor of our work, our bright colors and clean linework. Along with a small collection of photos here, check our portfolios on our shop Facebook page. To really get to know our work, please come visit our studios, meet us, and see what a great time we have creating artwork for people from all walks of life, and from all over the world. Even if you don’t want a tattoo, it’s fun to pop in and watch the magic happen. We price our tattoo work by how long each piece is expected to take. People often ask about pricing their tattoos before they even have a certain design figured out. It’s hard to price something that hasn’t been chosen or designed yet, but here are some guidelines to how we price things. Tattoos are priced by time, but cost varies with the experience of the artist and the length of the session – big sessions cost less per hour than small sessions. The detail, size, difficulty and placement on the body all affect the amount of time the tattoo will take. For the best deals on longer sessions, ask about our Buy-A-Day for one or two people, offering a whole day of tattooing with one artist for a flat price. Lots of people already have tattoo work which they aren’t happy with. Sometimes we can freshen up old tattoos, and sometimes we can design cover-ups which make their old tattoo disappear. However, fixing up and covering up old tattoos is a very special kind of tattoo design, and not all tattoo artists understand how to approach it. For example, you can’t just plop any old design over a tattoo you are unhappy with, and expect it to disappear – if you haven’t designed it properly, the old tattoo will come through as a ghost image in your new design. It takes a unique talent to take an old tattoo and turn it into a new “hey, I never knew you had a tattoo there” work of art. If you have old work and you’d like to see what we can do with it, please come into the shop for a consultation. The most beautiful tattoo doesn’t mean much if the tattooist didn’t protect your health. We comply with and exceed Oregon tattoo regulations. 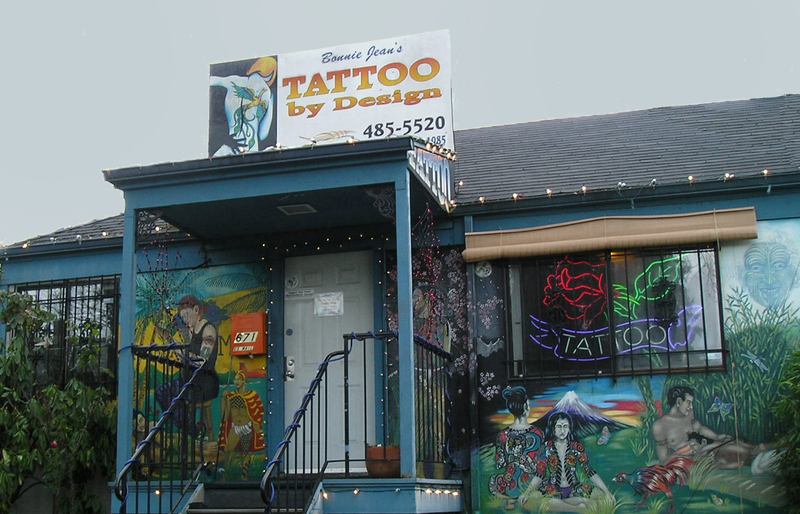 Bonnie Jean, owner of Tattoo by Design, puts a priority on safe tattooing, and trains shop artists to the same standards. We follow Standard (or Universal) Precau­tions to safe-guard your health. These are procedures which keep bacteria and viruses from transferring between people. All materi­als used for your tattoo are either disposed of immediately after your tattoo, cleaned with EPA-registered High Level Disinfectants (tuberculicidals), or sterilized in an autoclave sterilizer (needles, for example are always sterilized before use, even though we only use them once). We test our autoclave on a weekly basis in compliance with OSHA regulations. We have all taken the blood-borne pathogens class offered by the Alliance of Professional Tattooists, the first organization in our industry to prioritize edu­ca­ting artists about safe procedures. We also take part in continu­ing education to stay up-to-date on current health inform­ation. 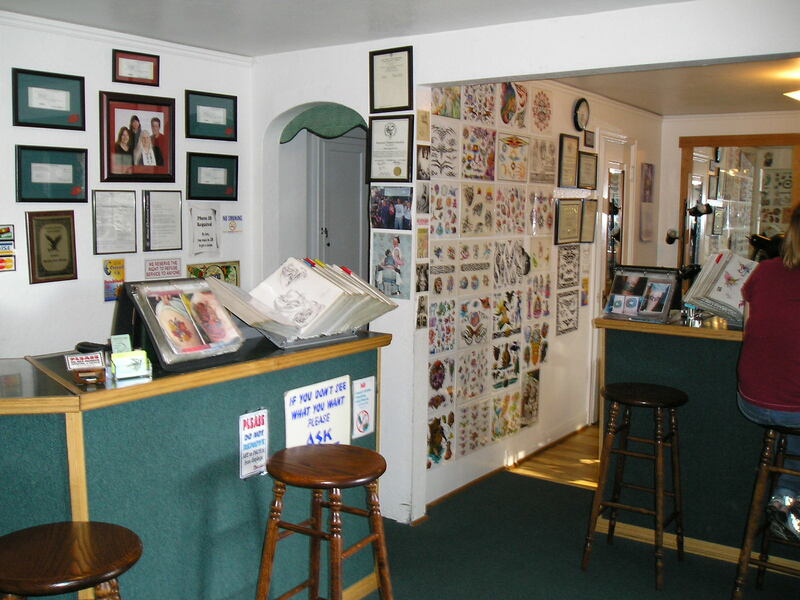 A tattoo at our shop is a safe tattoo – count on it!